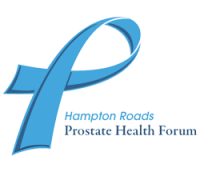 In June 2002, Charlie Hill, a founding member of the Hampton Roads Prostate Health Forum (The Forum) was diagnosed with prostate cancer. In December 2002, Mr. Hill underwent nerve sparing surgery to remove his prostate gland at Johns Hopkins Hospital in Baltimore, MD. The period between June 2002 and December 2002 brought front and center a disturbing reality for Mr. Hill. That reality was that the medical community had varying points of view regarding the best way to treat prostate cancer due to the many treatment options available and the lack of the same standard for all men. Feedback from the physicians indicated (and continues to be) that it is difficult for any physician to tell men with potentially “curable” prostate cancer which form of treatment is the best. Due to the various options about treatment and a cure, many men have difficulty making a decision on what to do at this very difficult time in their lives. As Mr. Thomas Farrington, author of Battling the Killer Within and its sequel Battling the Killer Within and Winning, with whom Mr. Hill consulted, stated, “There were no universally accepted standards as to what actually defines a cure”. Mr. Hill wanted a cure! He was the primary caregiver for his wife who lost a 17 month battle with lung cancer in June 2002. So his discovery that the lack of a universally accepted standard for treatment to cure and even treatment in general led him to talk with a wide range of people. This group included other patients, their family members, urologists, oncologists, internists, and other doctors, hospital administrators, nurses, pharmaceutical company representatives, and others who had an interest in the subject.